Direct marketers have always been backward thinkers. They always start their thinking process by focusing on the end result, the outcome, then figuring out what it’s going to take to get there. When you think about it, this is actually a great way to scope and plan pretty much any sales and marketing effort, whether it be a single campaign or an annual plan, whether it’s B2B or B2C. And it’s just as applicable to Not-For-Profit and social marketing as it is to corporate for-profit enterprise. You begin by identifying what the objective or outcome is that you’re after in specific measurable terms. It might be expressed as sales, new accounts, new customers, customer spending or value, reduced churn, units sold, or any number of other common desirable objectives. Now begin backing up step-by-step identifying and quantifying what has to happen at each step in order to realize the numbers you’re hoping to achieve. It’s easier to visualize this if you think about the classic sales funnel with the acquisition or closing of a new account, customer or sale being the outcome at the narrow bottom of the funnel. Here is a fictional, albeit simplified, example. Imagine that you are an ecommerce merchant who sells office supplies. You would like to run a national campaign with the goal of obtaining 200 new accounts. Your history tells you that each new order averages $200. So you are hoping to generate $40,000 in new revenue from the campaign. Now let’s walk it back. You know that the average total cost of that order, not including marketing, promotion and sales, is about 30%, or $60. This leaves you a margin of $140 to cover all sales costs and give you profit. Your profit goal is always a minimum 30% of revenue. On a per order basis, that’s an average of $60. That means that the most you can spend to acquire that order and maintain your minimum profit goal is $80 ($140 – $60). So far, so good. You now know that if you can obtain new orders at an average cost-per-sale of $80, you will be making money. Next, you can figure out what has to happen for this metric to be realized. From past experience, you know that your average online conversion (from visit to completed order) is 10% when the visitor has been driven to the site by other promotion. Now we flip over to the cost side the campaign you are thinking of running. Let’s say you are going to send out some targeted direct mail to lists you have rented and that the cost of this is about $.80 each. 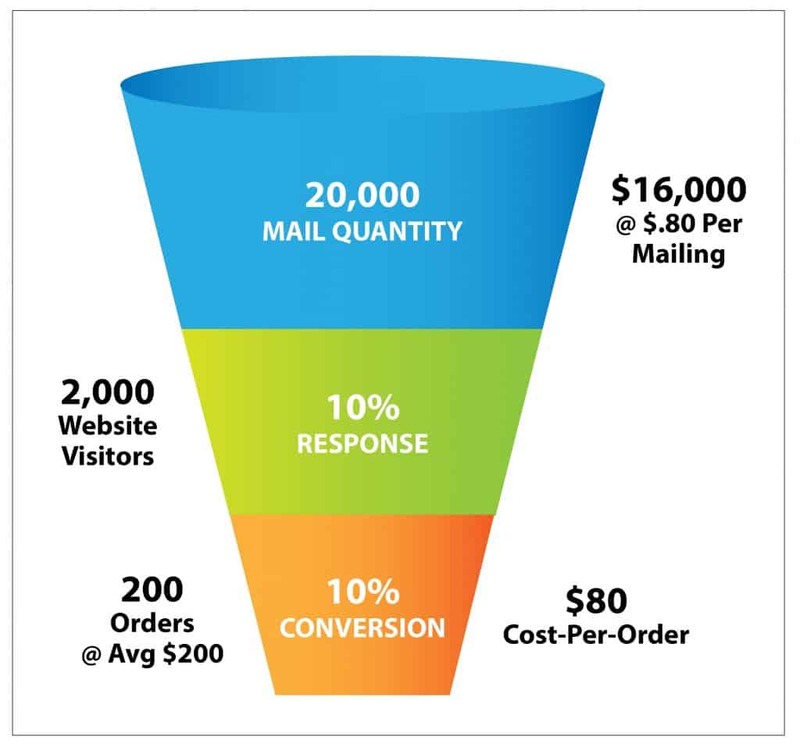 Defining response to your mailing as a purposeful visit to your ecommerce site, you calculate that, in order to get those 200 new orders you want at a 10% conversion rate, you need 2,000 visitors at your site. To obtain those 200 orders, you want to spend no more than $16,000 (200 x $80 cost-per-order). At $.80 per mailing sent out, you can afford a total mailing quantity of 20,000 ($16,000 ÷ $.80). From this you hope to generate 2,000 visitors to your website, which is about a 10% response rate. Working this way forces you to think about your sales and marketing process in a more step-by-step disciplined fashion. It suddenly becomes clear that sales don’t happen by magic and that sales leads don’t just materialize out of thin air. You can suddenly see clearly that you will need a certain level of market coverage to make your numbers work based upon the assumptions you put in place…and a certain level of budget to make that possible. Backwards thinking that is good for you.